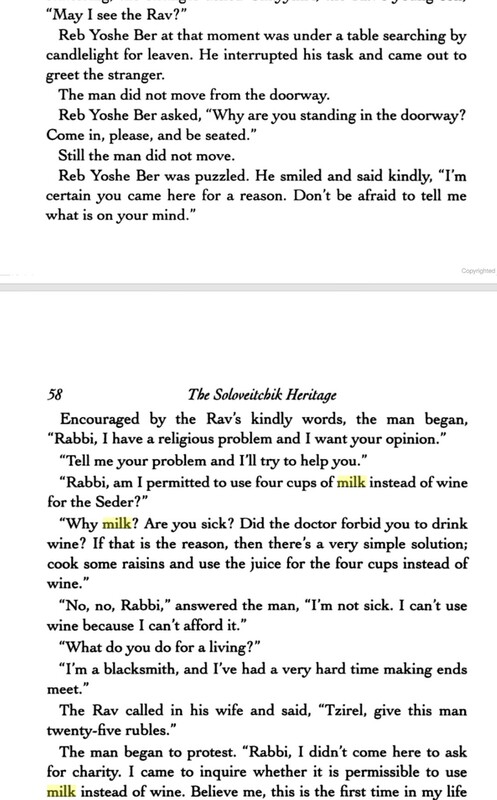 A man could not afford the wine for the four cups of the seder, and asked the Rav whether he could use milk. The Rav offered to pay for wine, and gave him much more money than wine would require. The wife of the Rav overheard the transaction and later asked the Rav why he had provided so much money. 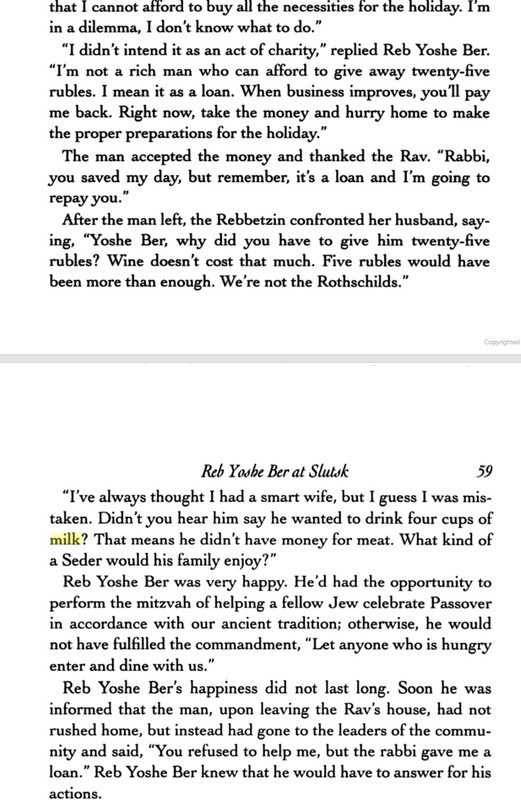 The Rav replied that because the petitioner had suggested milk, it is obvious that he cannot afford meat either. What's the source of this story? Did it actually occur? In her book about the family heritage, Shulamit Soloveitchik Meiselman writes this exact story about her great-grandfather¹, Rav Yoshe Ber Soloveitchik². 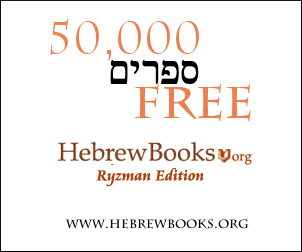 Also known as the Beis HaLevi. I couldn't select the words to copy, so here are screenshots of the story. 2.In the book, he goes by Rav Yoshe Ber, while in some other places, you'll find that he goes by Rav Yosef Dov Soloveichik. You can be sure it's the same person, as the Wikipedia page about him, says that he lived from 1820 to 1892, same as the info found in the book on page 41. Not the answer you're looking for? Browse other questions tagged passover-seder-hagada story-identification four-cups-wine . Why do Ashkenazim say a b'racha for each of the four cups? Four cups of wine by the Pesach Seder — From the Torah? Why do we say an after-bracha only for the last of the four cups at the passover seders?